"Everybody wants something. 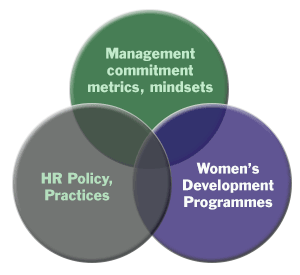 Find out what it is and connect your want to theirs"
The Women’s Sat Nav to Success™ is the most authoratitive product on the global market in delivering the ‘Women’s Development’ component of the McKinsey 3-dimension gender diversity ecosystem. The Women’s Sat Nav to Success™ has been developed through 7 years of dedicated research with a dual focus on identifying practical and proven routes to success and understanding the psychological dynamics which make changing the gender balance so deeply difficult. This means that our model and approach is deep, detailed and powerful delivering step-changing results for clients – both organisations and individuals. Potential candidates are required to complete a screening application followed by a formal interview. Our Women’s Sat Nav to Success™ Network Accreditation Programmes then provide the full training to successful candidates. On completion of the relevant programme (coach and mentor or facilitator and trainer programme), graduates can move onto full accreditation via assessment of client case studies. Joining the Network means you become a member of an interactive and supportive community. Network gatherings will provide you with new stimulus, case studies, market and research information and relationships with other awesome professionals.